Mary Magdalena Lewis Tate founded a Pentecostal denomination and became one of the first American women to hold the title, Bishop. Born in Vanleer, Tennessee on January 5, 1871, to Belfield Street and Nancy (Hall) Street, she married her first husband, David Lewis, at age nineteen; they had two sons. As that marriage broke up, she began preaching close to home. Soon she traveled several hundred miles as she crossed state lines into Kentucky and Illinois. Along the way, she gathered converts into “Do Rights” bands, so named because people responded to her message by wanting to “do right.” These associations in Illinois, Missouri, Kentucky, and Tennessee purchased property to house a meeting place for their worship services of song, testimony, Bible study, and preaching. In 1903, she gathered these groups into the Church of the Living God, the Pillar and Ground of the Truth. As the number of churches multiplied, she held a General Assembly in 1908 in Greenville, Alabama. During the ten days, she ordained ministers, officially incorporated the denomination, and presided as bishop. The denomination grew rapidly and spread into twenty states, prompting her to appoint state Bishops to oversee churches within state boundaries. Her sons worked alongside her. To solidify further the denomination, she assembled its doctrines, rules, rituals, and governing structures into a Decree Book and distributed it to the churches. At the core of Tate’s teaching stood the concept of cleanness. Cleanness, she taught, must direct one’s entire life, from eating and drinking, to marriage and family, even to the way one participates in social and community affairs. Over time she divorced three husbands to avoid association with their uncleanness. Bishop Tate chose Nashville for her denominational headquarters, and in 1923, with her approval, the denomination purchased eleven 50 x 140 city lots for $5,000, including a large brick building with five rooms. The publishing house opened in the building after it was renovated and equipped with printing presses, paper cutters, print type and type-setting equipment. Part-time workers hired from several African American schools in the area staffed the publishing house. For two decades from this location, the New and Living Way Publishing Company printed Sunday School literature, music, and several periodicals. Tate provided open and visible access for women’s leadership. She purposefully used generic language when referring to church positions in order to make them available for both genders, and she mentored women to take their place in leadership. In response, women answered her call. During the denomination’s first century, several hundred women served as evangelists, ministers, and bishops in the Church of the Living God. 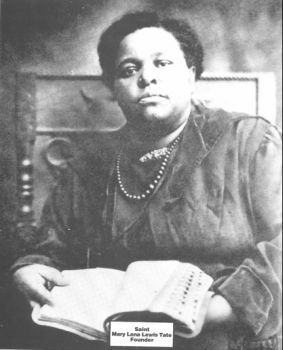 While in Philadelphia on church business, Bishop Mary Lena Lewis Tate died in December 1930. A branch of the original church survives under her grandson, Bishop Meharry H. Lewis, and unequivocally supports women ministers, thus keeping alive Bishop Tate’s vision. Estrelda Y. Alexander, Limited Liberty: The Legacy of Four Pentecostal Women Pioneers (Cleveland, OH: Pilgrim, 2008); Meharry H. Lewis, ed., Mary Lena Lewis Tate: Collected Letters and Manuscripts (Nashville: The New and Living Way, 2003).